After weeks of speculation and rumors, Kensington Palace announced Monday, October 15th that Meghan Markle is pregnant with her first child, due in the spring of 2019. The time at which the Duke and Duchess of Sussex decided to announce the fact of the pregnancy is fairly interesting: before their royal tour of Australia, Fiji, Tonga, and New Zealand. Because of this, the royal couple has received many baby gifts while traveling. These gifts, according to the British newspaper, the Daily Express, included a stuffed kangaroo from Governor General Peter Cosgrove and his wife, Lady Lynne Cosgrove, while in Sydney, Australia. They were also given fleece Ugg booties from the couple. However, there is a royal gift policy, as noted in the Sunday Express, stating that presents can be accepted and used only if the gift is worth less than £150––around 200 United States dollars. If the item does not fit these qualifications, it can be put into storage for up to five years, given to charity, or thrown out. Besides the Governor and his wife, well-wishers in the Sydney crowd attempted to give the couple baby gifts ranging from teddy bears to stuffed hippos. 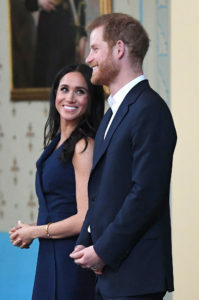 Family members of the royal couple are reportedly “delighted,” including Markle’s mother, Doria Ragland, who is “very happy.” The Queen, is reported by the Express to have been “beaming” about the pregnancy when she attended a Royal Air Force Club event––the first after the couple’s announcement of the upcoming birth of her eighth great-grandchild. Overall, this year has been an eventful one for the royal family, including the birth of Prince Louis, Meghan and Harry’s wedding and now pregnancy, and Princess Eugenie’s wedding that just occured on the 12th of this month. There were rumors flying around in the royal-crazed sections of the internet that the Princess’ and Jack Brooksbank’s big day, a ceremony pushed back to accommodate for the wedding bells of Meghan and Harry five months ago, was overshadowed by the couple’s baby news. While, according to Vanity Fair, “the pregnancy news was almost definitely a major topic on the day of Eugenie’s wedding,” Eugenie may not have minded. However, some believe that her mother, Sarah Ferguson, certainly did mind—with her Twitter spree about the wedding. Some speculate that Ferguson did this to keep the focus of the royal fans on her daughter’s wedding instead of the pregnancy, which was announced at the same time. However, Eugenie herself waited until the day after the announcement to post anything about her wedding to her own Instagram account, perhaps showing respect to Meghan and Harry in the initial 24-hour news cycle of their pregnancy announcement. According to sources including Vanity Fair and Elle, the reported “drama” ended when Eugenie, the only royal of her generation with a public Instagram account, liked a picture of Markle on an Instagram fan account for the Duchess. As for baby names, Meghan reportedly said that “we’ve been given a long list of names from everyone, we’re going to sit down and have a look at them” while on tour. British oddsmakers are already beginning to predict the name with bets on Victoria, Alice, and Elizabeth. Albert, Arthur, and Alexander may also be likely options. Other than these, the names Charles and Diana are also in the running after Harry’s parents—but his mother, in particular, who passed away in 1997. First-year Abigail Dotterer is a Staff Writer. Her email is adottere@fandm.edu.